☾☆ It’s hard for me to believe, but on Monday, my baby, Wild & Free Jewelry turned SEVEN years old! What a beautiful, challenging and exciting trip it’s been so far. In honor of the journey, I want to take a moment to write a year end reflection post, because, this past year with Wild & Free Jewelry goes down in the books as one of the hardest, most emotionally trying, to date. My journey with Wild & Free Jewelry begins a lot like a fairy tale dream come true and during the first five years, I hadn’t once doubted my passion. Only recently, in the dawn of my sixth year, did the doubt and insecurities come rushing in. I want to share this side of the story because it’s important to know that the journey of pursuing a passion isn’t easy. I genuinely believe that when you pursue something so close to your heart, it will no doubt rip you at the seams, as by nature, it’s designed to challenge and expose, ultimately creating a heightened vulnerability that tests your dedication to persevere. Fortunately, like most things, there’s a silver lining amidst the darkness associated with feeling lost and uninspired, and that’s what I aim to shed light on today. At one point or another we’ve all likely experienced some sort of intensified sense of insecurity. It’s easy to fall into this headspace, especially with the rise of technology and the dominating scope of social media. All it takes is a flicker of self-doubt or one mental thought of comparison and suddenly you feel unfulfilled and anxious. Today, the devices we use play a key role in creating the filter in which we choose to view the world. While I’ve always understood this concept, until recently, I lacked the awareness to apply it to my thoughts as they occurred. Without this present acknowledgment, the information we digest via screens has immense power over our emotions, logic and mindset. Last year, I learned this the hard way as I struggled to push forward with my brand in the wake of the Instagram algorithm reconstructing the entire way I’ve viewed and used the platform in previous years. I know I share this sentiment with many countless small business owners, but suddenly I felt extremely defeated by technology and super uninspired. Once this emotion begins, it’s hard to shake. In this creative rut, I felt my focus shifting inward, and in attempts to catch a breath, I shut down my website & Etsy for months on end. I unplugged completely from my blog and social media multiple times as I continuously felt emotionally drained by the thought of having to post. This looming feeling of discouragement caused me to intensely analyze my life’s path and at one point I nearly felt I wanted to quit being an entrepreneur, delete all my social media and start a career in a different walk of life. Feelings of doubt and confusion took 2017 by storm and while I continued to have emotional lows, I told myself to persevere. I worked hard to keep creating, keep dreaming and keep shining positivity out into the world. Then, slowly, like clouds parting to reveal blue sky, I discovered the magical feeling of creativity all over again. The mental shift that occurred during that transition is something I’ve held close ever since, and I have a feeling others who may experience a similar sentiment of defeat or heightened insecurities after looking at a screen may need to hear what I learned during that crucial time. Prior to my transformation, I knew a major part of breaking free from my uninspired cage relied on letting go of any mental perspective that prohibited happiness. For me, a lot of the stress associated with my creative drought relied on how much my life suddenly revolved around technology. I felt this daunting pressure to consistently log on to a platform or record my life at all points of the day. This practice left me feeling lost and slipping out of the present. I felt like I began to lose touch of why I started creating to begin with and it was hard to find my bearings and strike a balance between my job’s necessity for technology and my desire to disconnect. So, I decided to analyze my relationship with technology, especially that of social media. In this momentary step back, I learned a few things. First, I learned the importance of detaching from, and limiting my exposure to, the virtual world. We’ve all grown accustomed to pulling our phones out in moments of silence, staring at endless feeds as we seek to occupy the mind. In lines at the grocery store, in conversations, perhaps even at the dinner table, our focus shifts repeatedly to a screen. I unknowingly fell victim to this practice and didn’t realize in the process how it began to shape my perception of reality and my ability to foster self-love, which in turn, massively effected my creativity levels. Only in a true disconnect did I realize the way technology was beginning to negatively impact my mindset. In a single trip to the store without my phone I found myself engaging with others in a more authentic and fulfilling way. This is not to say that I had previously used my phone during entire outings in the past, but if I had pulled it out in line to occupy the time, it would set me in a completely different headspace than ignoring it all together. Abandoning this habit turned otherwise shallow interactions with employees or people in the parking lot into genuine and interesting conversations. I found myself quickly making new friends and heading home feeling happier. Without the option to default staring at a screen, I realized how ALIVE the world truly is. I began to pick up on interactions, colors and sounds I hadn’t previously been aware of. With this shift, I entered a vibrant world of opportunity, seamlessly taking my focus out of my head and into the present. It’s startling how such a small decision opens endless new doors. After realizing the extent to which my phone disrupted my mental perception, I felt ready to abandon technology all together. Of course, social media, e-mail and the internet had become the driving factor sustaining Wild & Free Jewelry and without it, I would have to uproot my entire career. At first, this option didn’t seem so bad, and I sincerely considered giving it all up. Yet something pushed me to persevere and with that nudge came the understanding that I had to strike a balance between using technology and maintaining a healthy, positive mindset. Through this discovery, I learned a second important lesson, in that engaging in the virtual world at all requires a certain level of self-awareness and an ability to stay grounded in the present. I believe using any type of media can be executed in a healthy way but it must be done with a strong amount of intent and the understanding that what truly matters exists beyond the screens. If too much importance is projected into the virtual world, then the real world quickly becomes clouded with judgement and insecurity. Using social media with the intent to foster a positive mindset requires a lot of discipline and a rock-solid knowledge to always operate through a carefully constructed lens, using the platform to connect authentically and digesting the information in a compassionate, non-egotistical way. The user must be highly aware of their thoughts as they occur to honor this balance. During the height of my insecurities, I consumed information on social media in a personal manner, unknowingly attributing a displaced sense of meaning and power to the platform. In this mindset, I would relate images on my feed to my life or compare my body and relationships to what I perceived I was seeing on a screen. Through the practice of analyzing these comparisons in the moment I could prohibit the thought process from happening and learn to acknowledge someone’s post as a form of expression completely unrelated to my life. This seems simple now, but the ability to understand what someone chooses to post exists separate and uninvolved in relation to my life was something I sorely lacked before. With this understanding I began to see ways in which the entire experience can be altered to suit a different reality. It’s this revelation that brings me to my third, most important, lesson learned. Social media is what you make it. The flip side to feeling defeated, lost and confused after scrolling through a feed, is logging off feeling inspired and fulfilled. Wouldn’t it be wonderful if every time we looked at social media we felt this way? Imagine how much more productive we would be in life, how kind we would be to others and how much more we would believe in ourselves if we simply learned how to change the game. Imagine if we learned how to use the platform to our advantage rather than let the platform use us. If we could master this, we would enter a beaming, artistic, wonderful world full of creatives all sharing their artistic vision. Social media is a place where we can catalyze inspiration on an exponential scale. We can learn, educate, share and spread kindness faster and easier than ever before. We can express individuality and celebrate our differences all at once. In this reality, the crippling fear of judgement and the tendency to play the comparison game melts away and an exciting community of united humans emerges. With this mindset, instead of looking at a photo in numerical likes or engagement, you look at it as a mechanism to connect with REAL people. You begin to build relationships and create new friends, all in the palm of your hand. In this way, instead of social media existing as an isolated experience, it becomes a massive, exciting, collaborative effort. When I first discovered Instagram (before it was owned by Facebook), this is how it felt. The app back then had a feeling of authenticity, and it was exciting to find accounts to fall in love with, or new people to connect with. Yet, somewhere along the line that feeling disappeared for me, and only with this perception struggle and re-evaluation was I able to get in touch with that original sentiment again. Once I chose to shift my perspective I found this reality in an instant. It seems crazy that I could let what’s happening on my phone change my entire outlook on life. Yet, it’s something that happens so instantaneously that most might not realize they’re living in an altered state of reality. Many believe social media thrives off materialism, insecurities and judgement, only existing to feed the monster ego and nothing else. I can see the truth in this statement and I’ve certainly lived the consequences of feeding into this mindset. Which is why I sit here writing this to you now. Because I believe it’s all too easy to fall into that trap, and I think it’s a responsibility to remind others that we have the power to sculpt the experience and make real life connections in a positive uplifting way rather than fall victim to the impersonal, competitive, ego of it all. Year seven was the first time I experienced a real loss of creativity as well as the first time I felt like seriously giving up. Like any story regarding depths of emotions, the hardships of the year resulted in discovering a newfound sense of strength and immense personal growth. While this story may feel unique to my relationship with technology I think the broad dynamics of self-discovery and the process of learning to change a negative perception applies far and wide. Even if you’re someone who doesn’t struggle with social media, learning to re-evaluate your mindset regarding something else that may cause distress can work wonders on your mental health. Fostering a positive mental state is key to lasting happiness, self-love, kindness and compassion. Nourishing that state of mind puts you in touch with a sense of passion and a deep inner understanding of what’s truly important in life. It’s an essential part of being human and it’s easy to forget, but we have complete control over how we decide to construct that mental reality. 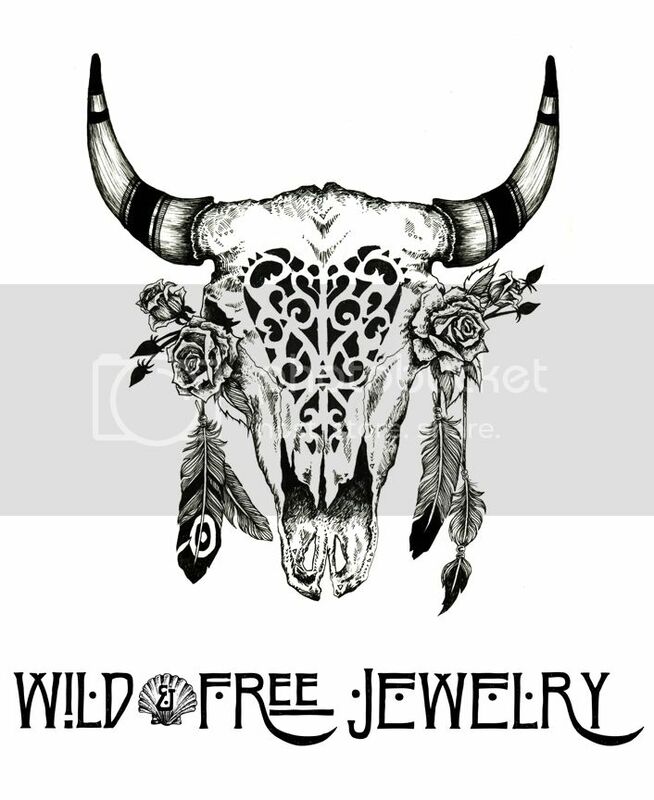 On a final note, I want to express my gratitude to everyone who has supported Wild & Free Jewelry the last seven years. It’s been a humbling experience to grow alongside my business and connect with so many from around the world. There were multiple points last year, in my emotional lows, that I would receive a message from one of you that would motivate me to continue working and keep my head up. You’re all so incredibly sweet and I am excited to take on year eight with more determination than ever before because of your continued support. Posted in the wild & free blog and tagged wildandfreejewelry, year reflections, year seven. Bookmark the permalink. Happy burthday!!! The moment I saw your blog I fell in love with it! I also bought your art – butterflies! SInce now you are my inspiration and I want to thank you with all my heart that you exist! Thank you for your honest words and for continuing to enlighten the world bit by bit (pun intended ha) through your creativity and social media. Unplugging can be a powerful experience, especially considering that it’s only been a few year we’ve been living with these technologies. I’m glad that you got through this empowered and always know that nature will be there to recharge you.